Originally a brownfield site, with contamination from industrial waste. 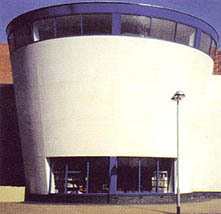 The library forms a key part of the Beckton Globe complex. Located close to the Royal Docks, the building design reflects the idea of a ship, a theme repeated internally. Built on a steel frame with no load bearing walls, allowing for flexibility. A large amount of glazing has been used to provide natural light. The children's area has recently been revamped with a fabulous new Mural.